It’s funny, it’s touching and at times it’s a tear-jerker. 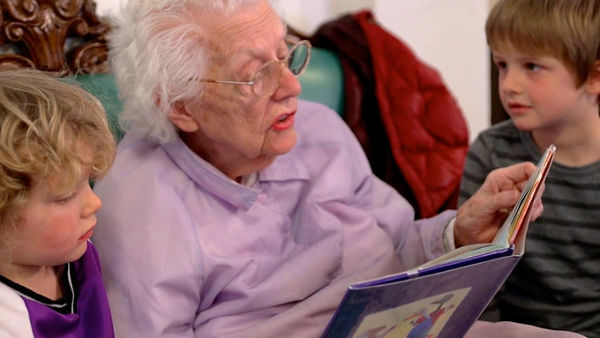 It’s the story of a retirement home that houses a preschool. The beautiful interactions between the students, who are growing up, and residents, who are growing old, are incredibly touching. Come inside Mount St Vincent’s Intergenerational Learning Centre in Seattle, with its unique program that sees children and elderly residents join together in planned activities five days a week. “Stepping into most any nursing home, it’s hard to ignore the sense of isolation one feels on behalf of the residents living there, and even harder to reconcile that with the fact that old age will inevitably come for us all. In our fast-paced, youth-obsessed culture, we don’t want to be reminded of our own mortality. It’s easier to look away,” says Evan. She says that while shooting the film, it was easy to see how “generationally segregated we’ve become as a society”. “Over the course of the months I was filming at the Mount, I observed many incredible exchanges between residents and kids. Some were sweet, some awkward, some funny – all of them poignant and heartbreakingly real. One experience in particular occurred during a morning visit between the toddler classroom and several residents who had gathered to sing songs together. Everyone had just finished a rendition of You Are My Sunshine when one of the residents began to share a memory he had of singing that very same song late at night on a bus full of soldiers while serving overseas during World War II,” Evan says. While the generational gap may seem like a yawning chasm, these young and old souls have so much more in common than we could imagine. There is a sense of living in the moment, joy in simple things and pleasure in the company of others – no matter how different they may be. Evan is working on finishing the film, by fundraising through Kickstarter. The campaign is getting close to its $50,000 goal, which will pay for the editing. Pledges start at $1.